It was a morning just like this that my father gently woke me. There we were – the two of us …just he and me and some ducks and their newborn chicks. We squatted at that water’s edge and watched and laughed and threw breadcrumbs as the mother and father ducks darted and dashed and dove down and under..catching them in their beaks and sharing them with their hungry babes. For me – at my tender young age – it felt as if we were there for hours. For he – at a much older one – I’m sure now it was only a moment among so many in his longer lifeline. Time that is immeasurable and often relative. Precious time spent – a father and his daughter. 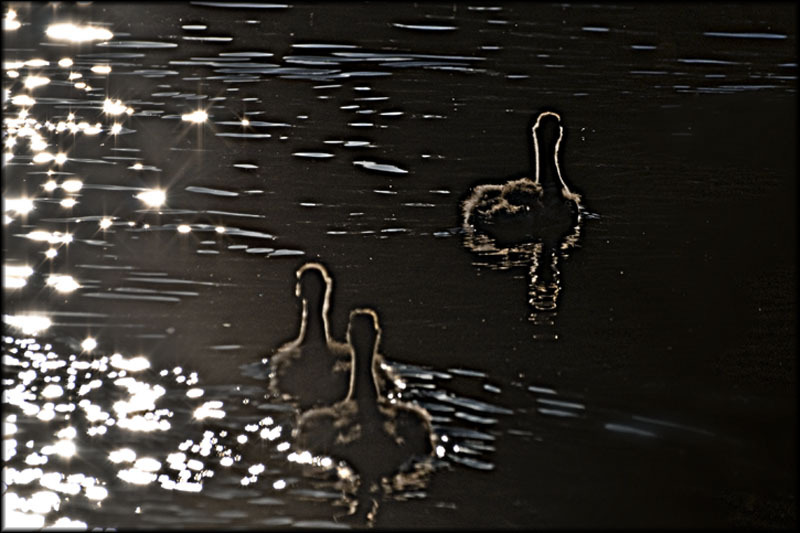 The two of us – just he and me – went out to feed the Canada Geese and their newborn goslings. We sat and watched and shared bits and pieces of that stale bread we'd brought with us. We laughed at their antics and what appeared to be such fun and folly. He remembers it as hours spent at the pond’s edge. I remember it as only a few short moments. Too short in the long scheme of time. Time that can’t be measured..weighed..quantified or counted. Precious time – a mother and her son. Someday – I'd like to think and imagine - it’ll be my boy and his baby girl daughter. That on a morning - just like this - he'll wake her..and take her on their own little adventure. And that on that very someday – they’ll be just like me and my father.